Let’s take a closer look at this tactical axe created by a company known as United Cutlery. The M48 Hawk Axe, model number UC2765 is a fairly lightweight axe with a broad, upswept blade and an ultra-sharp spike edge. The blade is forged from anodized AUS-6 stainless steel, finished with a scratch resistant black oxide coating, and then attached to the 30% reinforced nylon handle with three sturdy bolts. The handle doesn’t offer much in the way of a comfortable grip though there are non-slip grooves to keep it from flying out of your hands. I recommend gloves when using. United Cutlery includes a limited warranty with their products, which will cover manufacture defects in the event something goes wrong. Also included with your purchase is a nylon sheath with the popular button-snap closure. 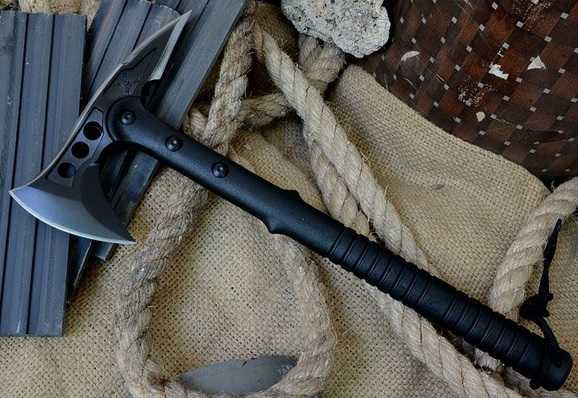 This tactical tomahawk is perfect for beginners or professionals with a light workload; it may look menacing, but it is fairly tame in comparison to some other tactical tools on the market. 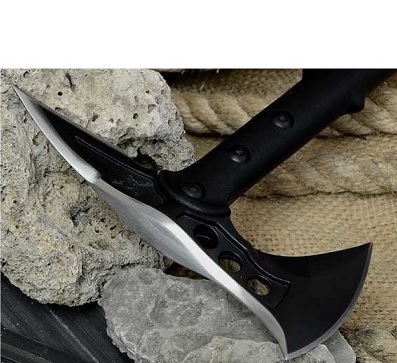 I would recommend the M48 Hawk axe to someone who wishes to use it for wood chopping, camping and outdoor activities, and minor excavation and breaching techniques. The first thing that you’ll notice about this axe is its weight; the piece is slightly top-heavy. Regardless, it is still a substantial and sturdy tool. While not recommended for especially heavy-duty projects, this axe with make ordinary outdoors and camping activities a breeze. There have been various complaints that I found regarding the quality of the materials, the most common being that the handle is prone to breaking where the tang ends. It seems this only occurs after extended, extreme use, but nevertheless that can be dangerous and debilitating. That being said, as long as you are not trying to rip through excessively tough or damaging materials, this axe can get you through your task. It easily bites through sheet metal and boasts an intimidating spike edge, which can be useful in penetrating or smashing through tough materials. When combined, the two parts can make a useful breaching tool if you needed to get into a door or car, for example. The black oxide coating gives the anodized AUS-6 Stainless steel a sophisticated finish as well as reduces the glare and offers slight protection against scuffs and scratches. 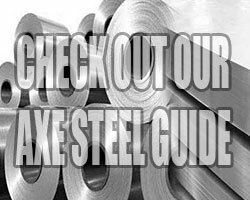 The steel itself is corrosion resistant, and while it may not be the highest quality available it is definitely strong enough to stand up against almost any tactical job you put it against. The nylon sheath is reinforced by easy-close, easy-open snap closures and it gives you the ability to hook it onto your belt for quick carry making it equal parts protective and convenient. The second edge on the head is expertly contoured sharpened for cutting and hooking. If I were giving my personal opinion, I would say I am not crazy about this tool. However, if you are mostly interested in the aesthetics or don’t have the need for an absurdly powerful tool, the United Cutlery M-48 is a highly recommended purchase. If you are looking for a handy device that will chop wood, dig holes, rip through sheet metal, or break through cars parts or doors, this tool will definitely get the job done. I would also recommend it to those who are interested in throwing axes for sport or show. I suggest you refraining from putting it up against extreme wear and tear, as the handle has a tendency to break, but with proper use and maintenance this axe will stay functional. The anodized AUS-6 stainless steel blade is attached to the 30% nylon handle with steel bolts and then coated with a black finish to reduce reflectivity and offer additional protective against deterioration. Like I mentioned, this axe may not be THE best, but it is absolutely a quality tool for the low price that you pay for it. This is a good axe for the price!